Donovan Mitchell bursts onto the scene as a rookie with the Utah Jazz, earning accolades and carrying his team to a surprise playoff win. While his second season hasn't been perfect, Mitchell is back on track thanks to the help of a few fellow NBA stars. Donovan Mitchell knew the challenges that awaited him following an outstanding rookie campaign. Utah’s second-year guard entered the league as the No. 13 pick in June 2017, then became the face of the franchise less than a month later when Gordon Hayward bolted to Boston in free agency. 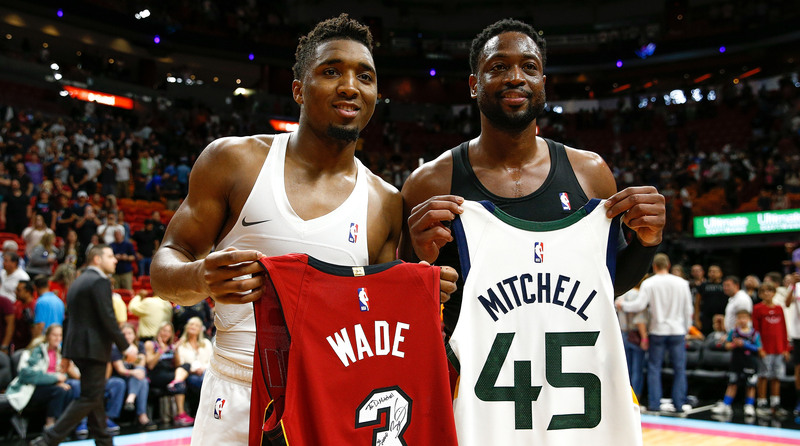 As uncertainty loomed, Mitchell became a star, leading the Jazz to 48 wins and a round-one victory over Oklahoma City in April 2018. Following an unexpected playoff success, Mitchell wouldn’t catch anyone by surprise in his sophomore season. Mitchell wasn’t ignorant to the pitfalls ahead. The Louisville product spoke with head coach Quin Snyder extensively in the offseason and strengthened his bond with NBA stars Chris Paul and Paul George. Mitchell starred next to James Harden in a new commercial for BodyArmor—the official sports drink of the NCAA Tournament—learning tricks of the trade from the reigning MVP. Mitchell came into the season mentally prepared, but his body quickly refused to cooperate. He battled ankle and rib injuries in November, limping out of the gate to start the season. Perhaps Mitchell drew too much inspiration from his chats with Harden. He leaned heavily on isolation attacks—anathema to Snyder’s system—shooting 29.3% from three before the calendar turned to 2019. Mitchell averaged just 20.1 points and four free-throw attempts per game through December, and his November was particularly rough. Utah had a negative net rating with Mitchell on the floor, scoring just 100.7 points per 100 possessions in 12 games. For reference, the Knicks are currently the NBA’s worst offense, averaging 105.2 points per 100 possessions. A measly free-throw rate plagued Mitchell throughout the season’s first half. Mitchell was one of 34 players to score 650 points in the 2018 portion of the regular season, but only six attempted fewer free throws. Mitchell’s efficiency waned as he avoided the foul line, with a string of jumpers replacing last year’s violent attacks on the rim. Mitchell’s offensive rating was 35th among the 42 players with a usage rate over 25% before January. He checked in just above Kris Dunn and Collin Sexton, falling behind Tim Hardaway Jr. The New Year marked a turning point for Utah. The Jazz are 23–10 in 2019, good for a 57-win pace. Mitchell has been on a potential All-NBA tear. He’s averaging 26.9 points per game since Jan. 1, shooting 39.2% from three while attempting 6.2 free throws per game. Seven of Mitchell’s 10 highest scoring games this season have come in 2019. He’s absorbing contact and avoiding jumpers early in the shot clock, and while a clean bill of health could be behind his return to form, Mitchell cites a message from Harden that helped turn his year around. So if we can assume Mitchell is ready for his second appearance on the playoff stage, just how long can Utah survive in the Western Conference gauntlet? A cruel spring could await. The Jazz are playoff tested despite their superstar’s youth, returning largely the same core from last year’s intense battle with Oklahoma City. Mitchell and Co. exited Houston last year with some valuable lessons, and the Jazz should be equipped to survive away from Vivint Smart Home Arena. But the bracket will be difficult. Utah enters Wednesday night seventh in the West at 41–29. A matchup against Denver could be favorable, with a pair of intense Mountain Time crowds. Fall to eighth, though, and the Warriors’ buzzsaw awaits. There's also the chance that Denver leaps to the No. 1 seed and Utah holds at seven. Round one against Golden State is almost certainly fatal. The Jazz should want no part of the Rockets, either. Houston is 10–3 against Utah since 2017-18, and James Harden is scoring at a Jordan-esque rate. Avoid the top two in the West, and the Jazz could have another series win under their belt. Meet Golden State or Houston in round one, and 2018-19 could be perceived as a step in the wrong direction. Aside from Mitchell, Rudy Gobert’s ascension is a major reason for Jazz optimism. The French Rejection is cramming dunks on everyone in sight, rolling to the rim with a nastiness and authority. Gobert leads the NBA in field goal percentage. He’s averaging a career-high 15.4 points per game. He tallied 151 dunks in 2017-18, but now has 253 and counting in 2018-19 entering Wednesday night. The Rubio-Gobert-Mitchell trio is averaging 112.4 points per 100 possessions in 2019, up from 106.8 per 100 possessions before Jan. 1. Utah’s offensive core has stabilized from its early-season swoon, due in no small part to glue-guy extraordinaire Joe Ingles. The hum of last year’s egalitarian machine has returned. Mitchell’s load is manageable. Utah’s expectations are still muted in terms of the Finals race, though, dampened both by the Warriors’ dominance and a field of eight quality teams. The Larry O’Brien trophy is unlikely to come to Salt Lake City this year. The West finals would be a major accomplishment. But don’t dismiss the importance of April and May to the Jazz’s future. Mitchell is preparing for the next decade in Utah, growing a contender from the ground up into the 2020s. With the help of some household names, Mitchell says he’s now ready to go from rookie sensation to bankable star.